Engineering software is a core business of Nemetschek right from the start in 1963. 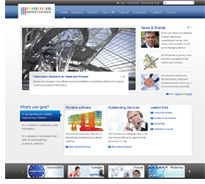 Today, Nemetschek has a broad product portfolio towards the structural engineering market with engineering structural analysis & design (Frilo Statics and Scia Engineer), structural detailing (Allplan Engineering & Precast), fabrication management and logistics (Technical Information Manager Precast and Steel) and interoperability solutions in BIM (Building Information Modelling). All construction materials are designed (steel, concrete, timber, bricks, aluminum, ...) with a unique offer for detailing (for concrete). With over 40 000 users, the Nemetschek Structural Group - consisting of Frilo, Scia, Engineering Precast, Glaser and a division of Allplan - is an important player active all over Europe and with increasing presence in South America (Brazil), Asia and USA. With over 35 Million revenues and a staff of 250 specialists, Nemetschek is a leader in structural engineering software. The staff is located in BeNeLux (20%), Germany (25%), Czech Republic (25%) and Austria (10%) with the remaining percentage distributed in Europe, Middle East, Brazil, USA and the rest of the World. A variety of clients from engineering consulting offices, contractors & fabricators rely on Nemetschek technologies for 3D modelling, static and dynamic Finite Element Analysis, detailed code design of all types of structural parts, drawing of reinforced concrete structures (in situ and precast) and fabrication management. Nemetschek is launching today the new website with a wealth of information inviting visitors to learn about its solutions. Enabling Engineering Freedom is our vision.